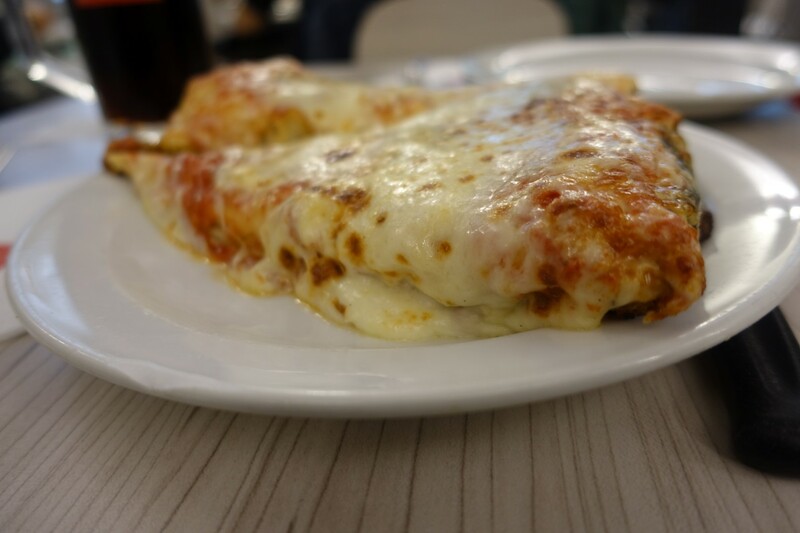 Delicious, thick, authentic Italian cheese pizza. Does it get any better than this? On to Croatia! Apparently though, going straight from Morocco to Croatia is really expensive. We don’t like expensive. Google Flights to the rescue! We cobbled together a much cheaper (and more fun) itinerary involving a two-day stop in Milan (flight from Morocco to Italy: $52.33 for both of us) where we had some of the best gelato and pizza ever—David, the handsome, generous chap who drove us from Bochum to Munich, let us stay at his place even though he was out of town and was basically the best host ever (he left a note which made it the only time in my life that I felt like someone would be disappointed in me if I didn’t eat all the delicious food in their fridge). The Cologne Cathedral, which is the largest Gothic church in Northern Europe. So large the top wouldn’t fit in the photo! Yeah, that’s the problem, not Joe’s poor selfie-skills. David and his girlfriend even took us out to a very fancy meal the last night of our stay, despite having just gotten back from their own travels. 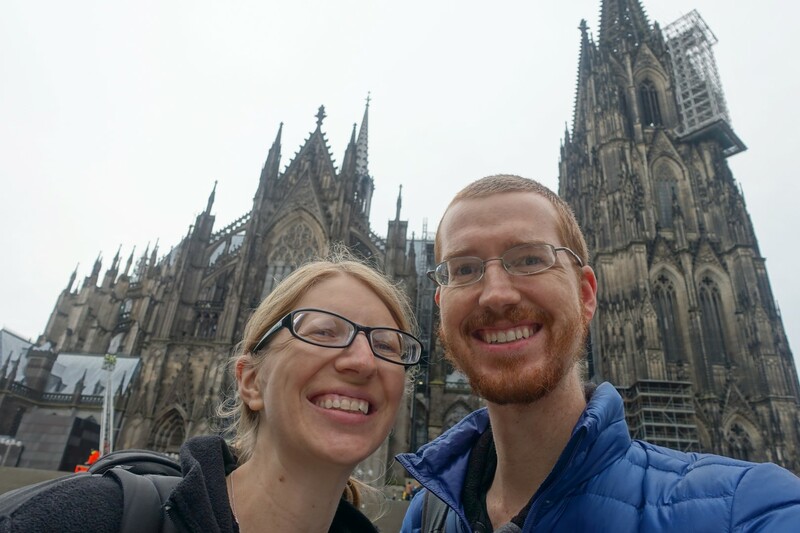 After that, we spent a day in Cologne, Germany (flight from Italy to Germany: $18..77 for both of us), and then finally we managed to make it over to Split, Croatia (flight from Germany to Croatia: $113.17 for both of us). We kept hearing great things about Split, so we knew we wanted to spend some time there. We got a place on AirBnB and settled in near Diocletian’s Palace, which was built in the 4th century by a Roman emperor. Nowadays the “palace” is full of shops and restaurants, though it still has some interesting things to look at, like a couple of sphinxes Diocletian took from Egypt to decorate his new digs (because when you’re a Roman emperor–or the British Museum–you do that kind of stuff). A view of Split from atop a very large hill we climbed. Oof, I’m getting tired just looking at that picture. 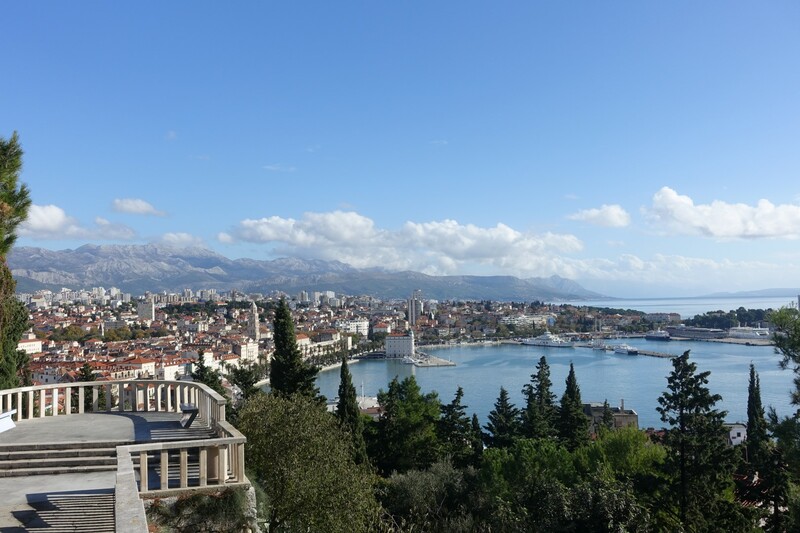 Split was a cool city, and the water was beautiful, but the number of tourists was a little much for us, and the hype had blown it up a bit too big for the city to meet expectations. Still a nice, relaxing city, though, with a great view from the top of a nearby hill. 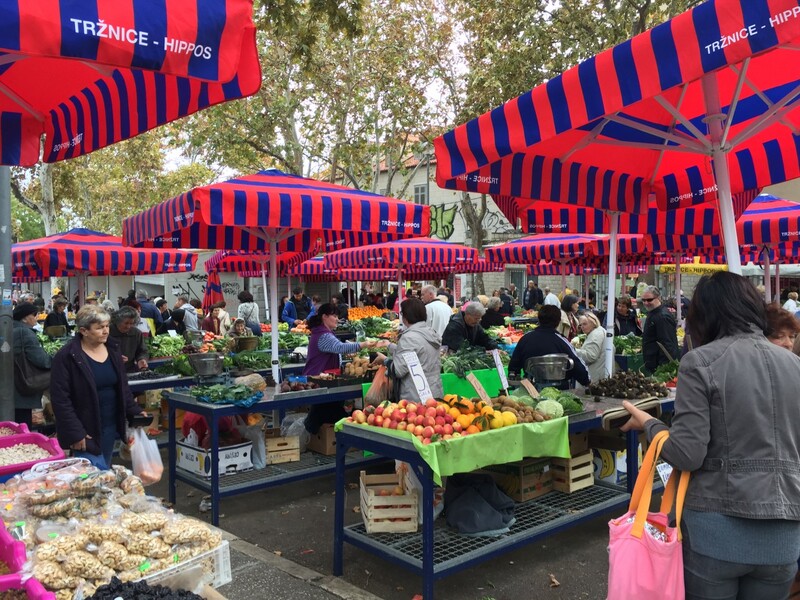 An outdoor market in Split. We were in Split during Thanksgiving, our first big holiday away from home (well, we were gone for Halloween, too, but you know what I mean). It was lovely, but certainly not a traditional Thanksgiving. Stuffing, cranberries, turkey, and pumpkin pie were impossible to find (it was like Croatian people didn’t even care about American Thanksgiving! ), so we had to tweak things a bit, and the fact that our AirBnB has no oven meant we needed to get creative. 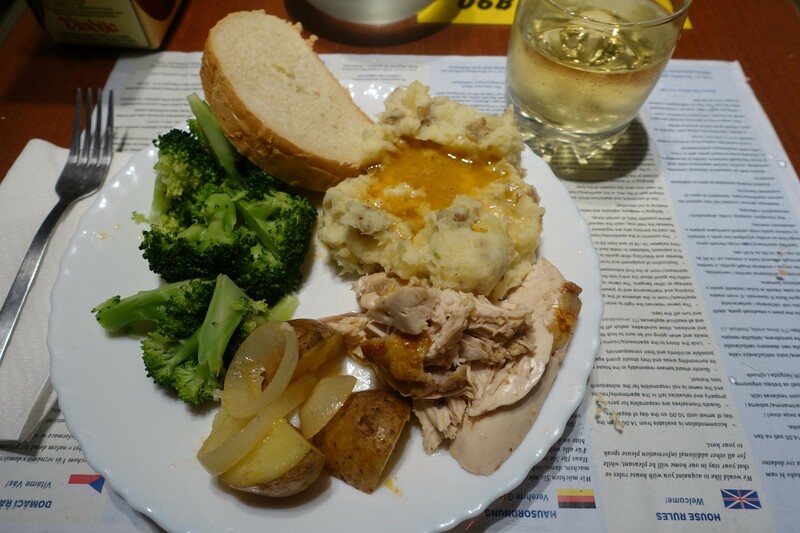 We cooked a chicken on the stove top and managed some mashed potatoes (hand-mashed using a wooden spoon and a fork, since we had nothing else to mash them with) and steamed vegetables, but we had to forego the other sides. Trying to make it all on the two-burner stove would have been miserable anyway. It was delicious and we loved our private little holiday meal. It was kind of like a metaphor for our entire holiday season, and maybe even our life in general. Not what you’d normally expect, and missing a few things, and maybe a little more difficult than it needed to be, but unique, and pretty awesome from our point of view. 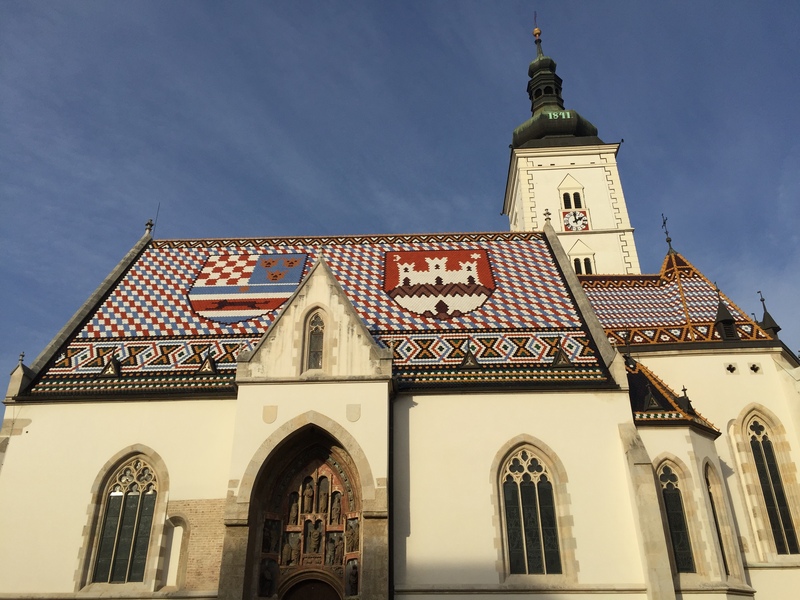 Before leaving Croatia, we also wanted to spend a couple weeks in Zagreb, Croatia’s capitol. Zagreb was especially interesting because we got there at the beginning of December, so Christmas events and markets were in place. Who WOULDN’T enjoy a man in a large dog-suit, rocking out and singing in Croatian? These kids loved it. 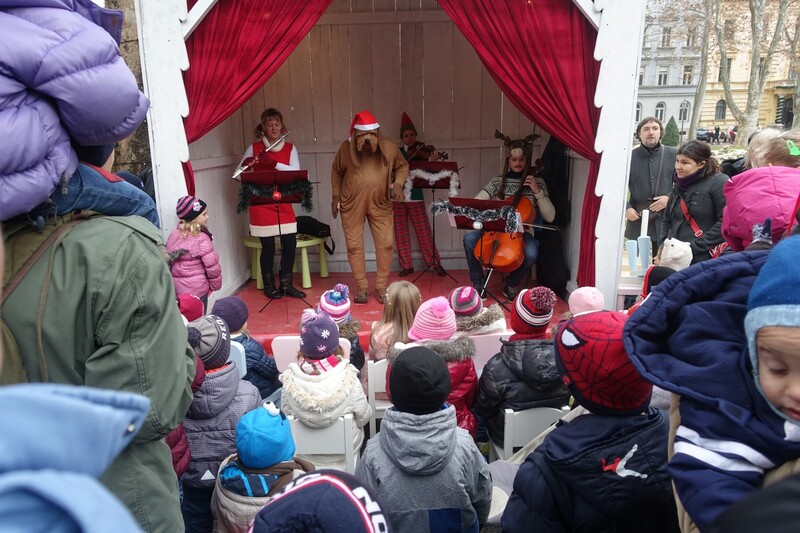 There were groups of schoolchildren singing, trees covered in fake snow, and dancing animals singing songs we couldn’t understand (but we assumed had something to do with Christmas). There were even a few really old-school touches, like a little puppet stage rocking some entertainment for the kiddies the way they do in books set in medieval Europe, and we even saw a Krampus (Santa’s evil counterpart) hanging out next to the weirdest Santa I’ve ever seen—since when does Santa wear a Pope-hat and long robes? Silly Croatia, they don’t even know about the red suit. It’s like Coca-Cola hadn’t influenced their version of Santa at all! We also saw a couple of cool old churches and whatnot there, too, but it was the holiday stuff that really made Zagreb fun. Doesn’t the roof of this church look like an 8-bit Zelda video game? Or maybe one of those perler bead art projects, where you lay down beads and then iron it to fuse it together? Click to see it larger, and zoom in, and I think you’ll agree with me. By mid-December, it was time to leave Croatia and take our last pre-baby flight over to Istanbul, Turkey. By this point, I was several weeks more pregnant than airline regulations like, but that’s just a technicality, not a health-thing, and luckily my 34-week belly could still pass for 28-weeks or fewer, so we didn’t say anything and hopped on the short flight over to Istanbul, where we planned to stay for the last six weeks of the pregnancy and the first six weeks of our daughter’s life. We enjoyed Croatia, but couldn’t wait to start this big new adventure in our lives. 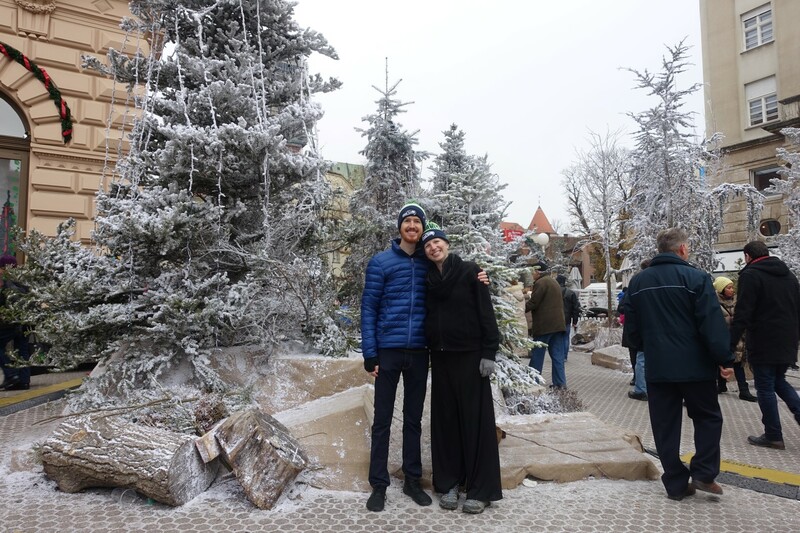 Joe and Ali enjoy the Christmas festivities in Zagreb. Our last Christmas with just the two of us! Found the blog via MadFIentist… Loving the pics of Croatia! I went to Split way back in 2003 but would love to go back one day, such a lovely country. Will keep watching for some inspiration of where we can go! Thanks! I didn’t care for Split much, it was too crowded like you said! We really enjoyed a town called Rovinj, the island of Vis and Zagreb wasn’t too bad, either.